Filipino fast food has arrived in Toronto in the form of a new Jollibee location in Scarborough. They just opened this past sunday, with huge crowds patiently waiting to try some Jolly Crispy Chicken and Jolly Spaghetti. What was the reason for all this hype? If you’ve never heard of Jollibee, it’s a fast food giant hailing from the Philippines that has been rapidly expanding globally. They have over 1200 stores around the world and serve a feel good menu of Filipino food that could be described as Filipino American fusion. They specialize in fried chicken, burgers and spaghetti. What makes Jollibee different is that they serve a variety of typical fast food items, with Filipino influenced flavour combinations. I was there on opening day and was shocked by the massive crowds braving the lineups to get their hands on some Jollibee. Most people waited anywhere between 8-10 hours, however people were genuinely happy and eye’s lit up whenever the Jollibee mascot passed by. The majority of people in the lineup were Filipino families who were both excited and proud for Jollibee to arrive in Canada. I spoke with a friendly family at the front of the line, who explained to me that the wait was truly worth it, as it was a chance to experience a “taste of home.” Another excited fan told me that Jollibee is ingrained in Filipino culture from a young age, as the go to spot in the Philippines for birthdays, graduations and celebrations of every kind. Jollibee gave out a special edition doll of their happy mascot “Jollibee” and a year supply of fried chicken to the first 40 in line. Growing up in Toronto, I had heard about Jollibee from my Filipino friends, so I was super excited to try some of their food for the first time. The Jolly Crispy Chicken is their signature fried chicken that comes in original or spicy, and gravy is a must. I love that the fried chicken is typically served with steamed rice. It also comes in a bucket of fried chicken, which Canadians may be more used to. Side options also include corn and mash potatoes. The chicken was very crispy and each piece of dark meat was juicy. Another popular item is their Jolly Spaghetti, that has a unique flavour profile as it’s made with sweet tomato sauce and chopped up hot dog sausages. One of the more Filipino influenced menu items is the Palabok Fiesta- an asian noodle dish with garlic-shrimp sauce, pork crackling, shrimp, sauteed ground pork and hard boiled eggs. This was my favourite dish! I love that you can get noodles at a fast food place packed with sweet, savoury and sour flavours. People love their fried chicken so much that both the Jolly Spaghetti and Palabok Fiesta come with a piece of Jolly Crispy Chicken if you order a combo. I also tried the Burger Steak, a simple dish consisting of 2 burger patty steaks covered in mushroom gravy and served with rice. For the full experience ask for more gravy and cover the rice too. Last but not least, you cannot go to Jollibee without trying one of their Peach Mango Pie, a crispy deep fried mini pie filled with a sweet peach and mango filling. 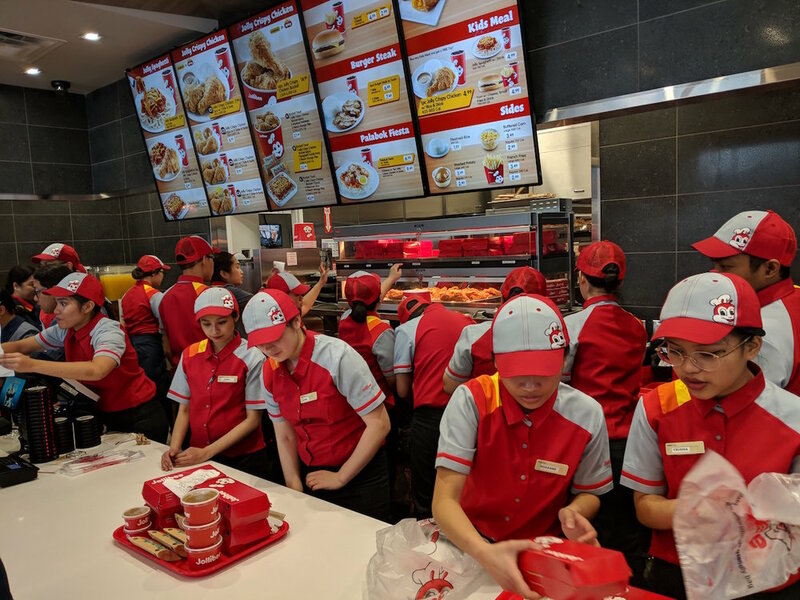 The flavour combinations might be unexpected for North American fast food, and some might think it’s crazy that people lined up for hours on opening day, but it’s a taste of home for many of the 800,000+ Filipinos living in Canada. The Jollibee brand and mascot epitomizes the optimism and joyful spirit of Filipino people. The significance of Jollibee’s first store in Toronto is beyond fast food, it’s a cultural celebration. Check out Facebook User “Maree Reyes” and Instagram User @kingdavidxiii’s comments below to appreciate why the new Scarborough Jollibee is such big deal for the Filipino community in Toronto. Disclaimer: This post is sponsored by Jollibee. In exchange for this post, I have received perks in the form of products and/or compensation. All opinions on this blog are my own.